Obsessed by the myths that surround hares, in 2009 I painted the picture of a white hare in the moonlight. This was inspired by a West Country legend that a white hare appears to fishermen to warn them of storms at sea. In November 2011 my wife and I committed to move to Hartland on the North Devon Coast; a location we had long had in our sights. The story began to form. Then the name Assander came to me in a dream and the stories began to grow to explain the origins of the legend of the white hare. Moving to Hartland in January 2012 we named our studio~gallery White Hare. The story of Assander crystallised with our move to Hartland. This was the place to which he came to find his purpose in life. The hare is a symbol of renewal and the cycle of nature in cultures all over the world; the story grew into three to follow the lineage of the original Assander. Set in the 1860’s the first story in the trilogy sees Assander travel from Southern Ireland to the rugged north coast of Devon. Assander’s is a magical story of a hare’s journey to find acceptance and to discover his place in a world wary of difference. Along the way he encounters hunters, smugglers, divine spirits and animal wisdom. It's written as a fast moving sometimes mystical story for all ages from about 9 upwards set on the beautiful Hartland Peninsula. 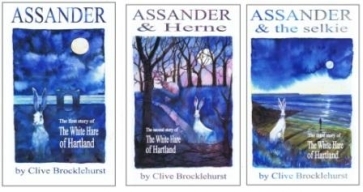 The second story in the White Hare trilogy sees Assander sent on Mid Summer’s Eve 1933 as a spirit hare to help his earthly kin to deal with a dark threat that has arrived on the Hartland Peninsula. Herne, a great hunter from English legend, is caught between two worlds with a story of his own to be told and retold with the help of the white hares. Assander and favourite characters from the first story return in an exciting adventure. They learn of great hunts of the past, help to avert a shipwreck and come to the aid of a young family in distress. With excitement, emotion, wisdom and humour this is another story for all ages set on the beautiful North Devon coast. The final story in the White Hare trilogy is set in 2012. The modern day Assander, descended from the original white hare of Hartland, meets the son of a character from his past. Together they set out to help a mysterious woman. In doing so they learn of an ancient Norse legend and discover a plan that endangers the whole coastline. With the help of familiar figures from previous stories and an army of white hares, they meet gun toting criminals, high tech security, international smugglers and wild storms. Full of excitement, magic, wisdom and humour the final story again features the rugged North Devon coast in a battle for freedom, for nature and for love. Assander is the story of a hare's journey from Southern Ireland to the rugged North Devon coast of the Hartland Peninsula.